For centuries, travel to Anglesey from the mainland was often hazardous. Ferries traversed the Menai Strait at various places, but the currents are tricky and numerous boats capsized or ran aground, often with loss of life. One of the most tragic occurred in 1785 when a boat carrying 55 people became stranded on a sandbar in the middle of the southern end of the strait. Attempts to refloat the boat left it swamped. The alarm was raised and rescuers set off from Caernarfon. But, the combination of high winds, nightfall and the fear of also running aground meant that the rescuers could not approach the sandbar. Night fell, the tide rose and those stranded on the sandbar were swept away. Only one survived. If you plan to visit North Wales to see the Menai Strait bridges make sure you stop by to see the Menai Bridges Exhibition, run by the Menai Bridge Community Heritage Trust. Are you looking for images of the Menai Strait bridges for your web site or publication? The photos on this page, as well as many others by the author, Warren Kovach, are available for purchase from Alamy. 'I heard him then, for I had just completed my design. 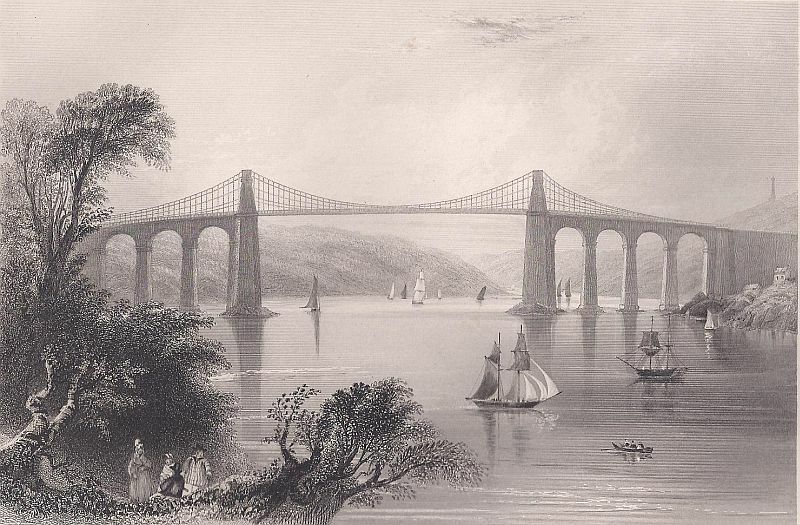 Despite much opposition from the ferry owners and tradesmen in the ports, construction of the bridge started in 1819. The stone used for the arches and piers was limestone quarried from Penmon Quarries at the north end of the strait, then carried down by boat. The ironwork came from Hazeldine's foundry near Shrewsbury. To prevent the iron from rusting between production and use on the bridge, the iron was immersed, not in boiling wine as the White Knight suggested above, but in warm linseed oil. The stonework was finished in 1824; then began the monumental task of raising the chains that would hold up the central span. Tunnels were driven into solid rock on either shore to anchor the chains. Then the first section of the chain was secured on the Caernarfonshire side, drawn up to the top of the eastern tower and left to hang down to the water level. Another chain was drawn up to the top of the tower on the Anglesey side. The central section of chain, weighing 23.5 tons, was then loaded onto a raft, carefully manoeuvred into position between the towers and connected to the dangling chain. While a fife and drum band played to encourage the workers, 150 men used block and tackle to draw the chain up to the top of the Anglesey tower to complete the span. The large crowd that had gathered to watch cheered wildly as the connection was made. The remaining fifteen chains were raised in a similar manner over the next ten weeks. Rods were then hung from the chains and bolted to iron bars that were used as the base for the wooden road surface. The bridge was opened on 30 January 1826 to great fanfare. Its completion, along with other improvements to the road by Telford, reduced travel time from London to Holyhead from 36 hours to 27 (today it takes 5.5 hours). The bridge has been modified and reconstructed many times over the years. The road surface was damaged in severe winds in 1839 and needed repair. The wooden deck was replaced with a steel one in 1893. With the coming of modern vehicles the previous weight limit of 4.5 tons per vehicle became an impediment. Overweight vehicles would have to carry their loads over in two or more trips. In fact, even bus conductors would regularly have to ask some passengers to walk across. So, between 1938 and 1940 the old iron chains were replaced with new steel ones, all while traffic continued to cross (see a video about the repairs here). In the autumn of 1999 the bridge was closed for several weeks to completely replace the road surface and strengthen the bridge. 16 March 2005 - A several month long project of repainting the Menai Bridge has begun, with the paint being completely stripped down to the bare metal for the first time in many decades and repainted. As a result, the video camera above will most likely show traffic control measures and scaffolding. The completion of the Menai Bridge was a boon in easing the journey to the island, particularly for travel to Ireland. However, the rapid rise of rail travel later in the 19th century meant that there was soon a need for trains to cross the Strait. When plans were first being made to build a railway to Holyhead it was proposed that the carriages be taken over the Menai Bridge; the carriages would be uncoupled from the locomotive at one end, then drawn across one by one, using horses, to a waiting locomotive at the other end. This idea was abandoned and plans were drawn up for a new bridge by Robert Stephenson, son of the locomotive pioneer George Stephenson. He faced the challenge of building a bridge rigid and strong enough to carry a heavy train of many carriages. This was done by making the bridge out of two long iron tubes, rectangular in shape, through which the trains would travel. When first conceived, the tubular bridge was to have been suspended from cables strung through the openings at the tops of the towers. However, after engineering calculations and tests of the finished tubes it was decided that they were strong enough by themselves to carry the trains. Like the Menai Bridge, the stonework of the Britannia Bridge was constructed of limestone from Penmon, although sandstone from various places was used internally. The tubes themselves were constructed on the banks of the Strait. Stephenson faced a much greater challenge in raising the 1,500 ton finished tubes than had Telford with his much lighter chains. He too would float the tube into position. However, the process didn't go as smoothly with the first tube as with the Menai Bridge chains and the giant tube came close to being swept out to sea. Fortune prevailed and it did finally end up in place. Then, very slowly, using hydraulic pumps, the tube was raised into position. Stonework was built up under the ends of the tube as it was lifted; this was to support it if the lifting equipment failed. This was fortunate because one pump did indeed fail, but the tube only fell nine inches. With the tubes in place the final touches were added. These are the four magnificent limestone lions that guard the entrances to the bridge. They were carved by John Thomas, who had also done stone carving for the Houses of Parliament and Buckingham Palace in London. The lions are almost 4 metres high and sit on plinths of equal height. The bridge was opened on 5 March 1850. The present day bridge has a much different appearance than the original. This is because it has been reconstructed after a disastrous fire in 1970. A group of teenagers looking for bats in the dark tubes accidentally dropped the burning paper they were using as a torch. This eventually started a ferocious fire through the whole tubular structure that caused so much damage to the tubes that they were in danger of falling into the strait. You can see video clips about the fire, including footage of the flames and an interview with one of the teenagers, on the BBC web site and Youtube (or a longer version on YouTube), and the 2d53.co.uk website has photos of the damage and a copy of the official report about the fire. As assessments were being made as to how to repair the bridge the local County Surveyor came up with the clever idea of making two bridges out of one. For many years there had been discussions of building a third bridge across the strait to ease the traffic congestion on the Menai Bridge. It was proposed that the Britannia Bridge be rebuilt as a two level bridge carrying both trains and road traffic. Rather than being a tubular bridge the new span is now supported by arches. A single railway track carries the trains to and from Holyhead. On top of this is a roadway carrying traffic on the A55 Expressway. And today, the lions that once had pride of place at the entrance to the tubular bridge now sit forlornly below the road surface as thousands of vehicles thunder past. View a fantastic aerial video of the bridge. taken from a remote control helicopter, here. Contemporary accounts of the building of the Britannia Bridge, as well as the Conwy Tubular Bridges, can be found in the volumes by Edwin Clark and William Fairbairn. Update - The closure of the Menai Bridge for repairs in 1999 caused severe traffic problems on the Britannia Bridge. This, plus the increase in traffic that inevitably will be caused by the building of a new dual-carriageway across Anglesey, means that there have been new calls locally for a third crossing to be built across the Strait. One favourite option is to build a new deck on top of the Britannia Bridge, so that it has two levels for cars. Whether this will happen remains to be seen. Update 2, Oct. 2001 - The latest plan being discussed to ease traffic is to build a tunnel underneath the strait, with one entrance near Gaerwen and the other beyond Bangor. It has been estimated that this would cost at least as much as the whole dual carriageway across Anglesey. It also may not be feasible because the strait is formed from a geological fault which is still occasionally active. An alternative is to convert the Britannia Bridge from two to three lanes, with the traffic direction of the centre lane changing at different times of the day. Update 3, Dec. 2006 - Five years later still nothing has been done to ease congestion on the bridges. The three lane solution has become the favourite short-term one, with the Anglesey County Council and the local assembly member Ieuan Wyn Jones campaigning for action by the Welsh Assembly. An initial feasibility study has been carried out and shown that the three lane solution is possible, and further studies are being done as to how it could be implemented. However the wheels of government are moving very slowly. Update 4, Nov. 2007 - A variety of options for easing traffic congestion have been proposed in a report by consultant engineers, as reported by the BBC. Besides the three-lane solution, there are two proposals for building a third crossing. There are also some proposals for widening the existing bridge, but these would entail demolishing the stone towers above the road level. The public consultation document showing the various options can be found here (it's in PDF format and requires the Adobe Reader program). Update 5, August 2008 - The public consultation about the traffic improvements has attracted over 1000 public responses. Out of these, 70% of the people would like to see a new third bridge, rather than modifying the existing Britannia Bridge or doing nothing. You can read about it here and here. Update 6, February 2011 - The Britannia Bridge is currently undergoing structural repairs of the metal work and stone piers. This BBC Wales TV report describes the repairs and shows some rarely seen scenes of the underside of the bridge and the inside of the stone structures (called "The Cathedral"). Update 7, February 2013 - Several years after the public consultation the Welsh Government have now said that they will be appointing consultants to further develop the proposals for a new bridge across the Menai Strait. Funding still needs to be found to do anything. Update 8, July 2014 - Another year, another period of horrendous traffic on the bridges due to roadworks, and another promise that the government is "is looking at the possibilities" of improving the situation. Our AM Rhun ap Iorwerth raised the situation in the Welsh Assembly after several days of traffic snarls on the Anglesey side because of closed lanes and slip roads on the A55. There were assurances from Transport Minister Edwina Hart that the three-lane "tidal flow" solution is under consideration but needs more risk-assessment. Read about it in the Daily Post. Update 9, December 2017 - Over the past year the Welsh Government has been raising the priority of a third Menai crossing, saying that construction could begin by 2021, and appointing a firm from Ruthin to come up with design options. This month they released a consultation document with four different options for placement of the crossing, and four different bridge design options. You can go to the Welsh Government web site to learn about the consultation process and view the consultation document. Update 10, October 2017 - The results of the consultation have been published, and based on the feedback, the Welsh Government have said they favour the Purple route (the one half way between the Britannia Bridge and Ynys Gorad Goch), with a four lane bridge. The existing Britannia Bridge would then be used for pedestrians and cyclists, as well as low speed local traffic. The majority of those surveyed favoured a balanced cantilever bridge, with a low profile, rather than ones with tall towers and cables, so as to not tower over the existing bridges. You can read a BBC News report about it, as well as the full results document. Construction could start by 2021.